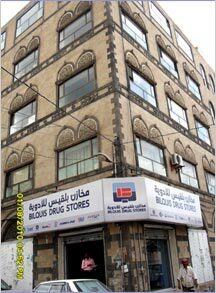 Bilquis Drugstores were established in 1970 as family owned company in Sana'a – Yemen. The foundation stone of Bilquis Drugstores was the Sana'a based pharmacy "Bilquis" which is still operating till date. 1978 – A separate division was set up. This division dealt with the import business of pharmaceuticals and baby milk. Bilquis Drugstores could then represent many World pharmaceutical companies and could expand its activities to cover the whole Yemen market. Besides, Bilquis Drugstores received many requests from foreign companies that want Bilquis Drugstores to represent them in the territory of Yemen. Other sales branches were opened later in other cities as well. 2000 – Efforts were made to expand the activity into the foodstuff business. Market survey was carried out accordingly, and consultations were submitted to the general management. Two years later, the foodstuff division was inaugurated. Products were then imported from some World companies specialized in this field. The sales policy of the company depends on goods distribution through its branches and representatives throughout the Republic of Yemen. The promotion of products is generally done by companies' medical representatives. Moreover, scientific symposiums are usually held by Bilquis Drugstores explaining product indications and benefits to physician , hospitals, family care centres and others. The company always takes part in the periodical medical fairs that take place in in the Republic of Yemen. In conclusion, we can comprehend how strong the company's position in drug market of Yemen is and how experienced its staffs, are. The company enjoys great reputation and respect by the officials of the Health Ministry represented by the supreme board of drugs and medical appliances for its role in providing drugs to all community members in the Republic of Yemen.